Van is a proud, loyal, charming Survivor, and once he identified all of us at The REAL Bark as his temporary family - we earned a friend for life. He is a 5 year old BEAUTY - handsome as ever and is ready to show you what an incredible pup he will be in his new home. Sadly, Van came from an abusive home. A 'family ' had him for over five years and then dumped him in the shelter when they had to move. He is missing one ear - hence his name - and we do not know if it was cut off by them, or what preceeded his arrival to our rescue. Some dogs are non-discriminate in so far as running up to everyone, and jumping all over them. Because Van was not socialized, growing up, he watches to make certain folks are friendly, and then reveal himself, step by step. He does well with structure and good leadership. He is enthusiastically fond of many of his familiar handlers and friends. Van LOVES his walks and hikes. 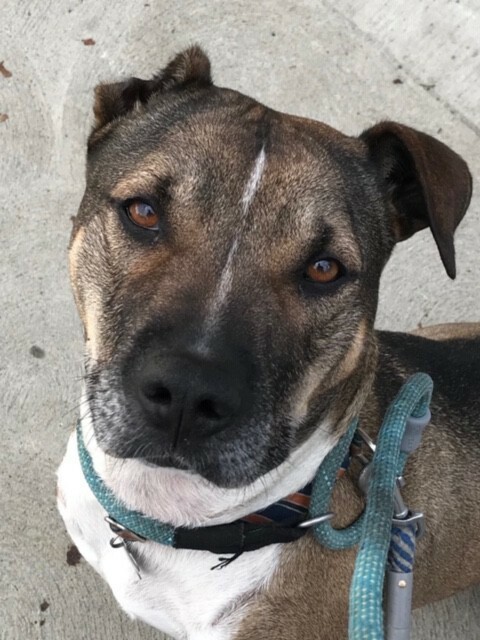 While he has dog friends that he has come to know through our rescue, we think it is best that he be in an only dog home with a stronger compassionate leader, as he does best when he loyally take on direction of his human friend. Van's ideal person//people are active, smart, and compassionate humans, that are less interested in a dog park dog, as they are a Companion for their walks, and treks. If you think you are the right fit for this wonderful boy, send us an email and we will set up the meeting pronto.